Norwalk, CT – May 19, 2010 –The SeniorCare Investor won the top editorial award, the 2010 Gold Award for “Best Publication of the Year: Newsletter” by the prestigious American Society of Healthcare Publication Editors (ASHPE) for the third year in a row. In the last five years, The SeniorCare Investor has won multiple awards that illustrate how a strong publication can successfully expand into other mediums. The interactive blog and audio conference series entitled “Conversations with Industry Leaders” have won numerous awards by the American Society of Healthcare Publication Editors, The Specialized Information Publishers Association, APEX and The Newsletter on Newsletters. The SeniorCare Investor is published by Irving Levin Associates, Inc., which is headquartered in Norwalk, Connecticut and is the leading publisher of newsletters, reports and online data on mergers and acquisitions in the seniors housing and health care industry. 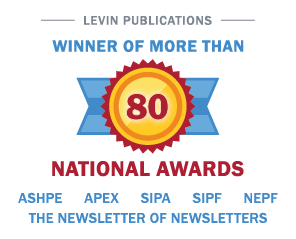 Please visit www.levinassociates.com or call 1-800-248-1668 for additional information.